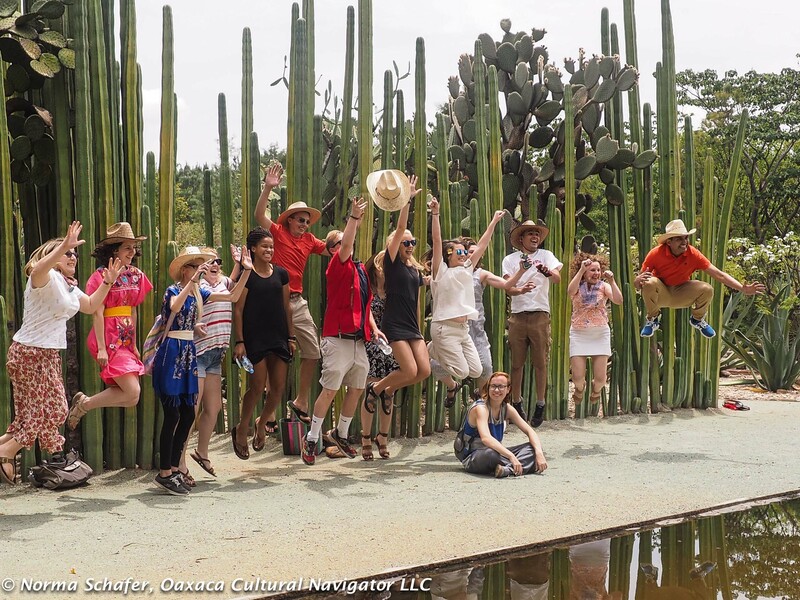 While I edit and process over 1,500 photos from last weekend’s WARP textile conference in Oaxaca, I thought I’d share with you the last set of photos from the May 2017 study abroad program with North Carolina State University Department of Horticultural Sciences from Oaxaca’s Ethnobotanical Garden. The garden was rescued from the hands of developers. In the last century, it was a military horse stable, a shooting range and a garbage dump. The plan was to build a luxury hotel on the site. But, through the efforts of Maestro Francisco Toledo and Alejandro de Avila, and others, the area next to Santo Domingo Church and monastery became the beautiful garden that we know and enjoy today. It opened to the public in 1998. 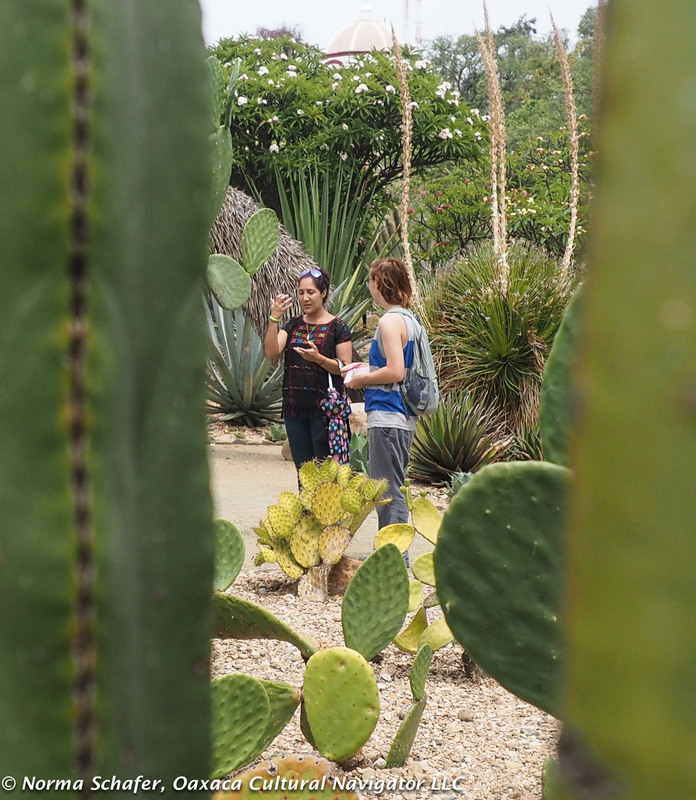 Our bilingual guide, Georgina Rosas, was exceptionally knowledgeable, explaining that the gardens are divided into the diverse ecosystems that reflect Oaxaca’s desert, mountainous and tropical landscape. One can only enter the garden and explore it through an organized tour. 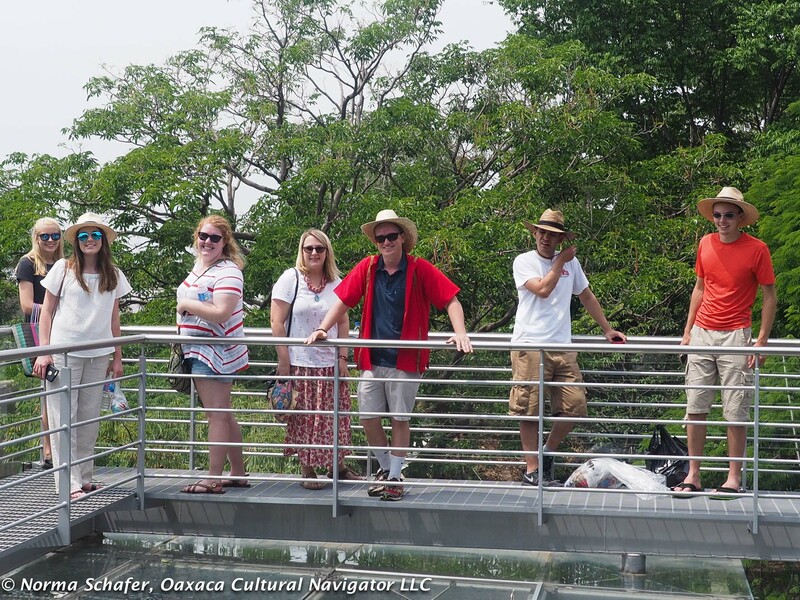 The English language tours are on Thursday and Saturday mornings, starting at 11:00 a.m. Tickets are a modest 100 pesos per person — well worth the two-hour walk through the plot. It is off-season and we were lucky. There was our group of sixteen people, plus another four visitors on the public tour. A small gathering in comparison to winters when there can be 30 to 40 people participating. It was delightful to be in the garden during the spring blooming season. 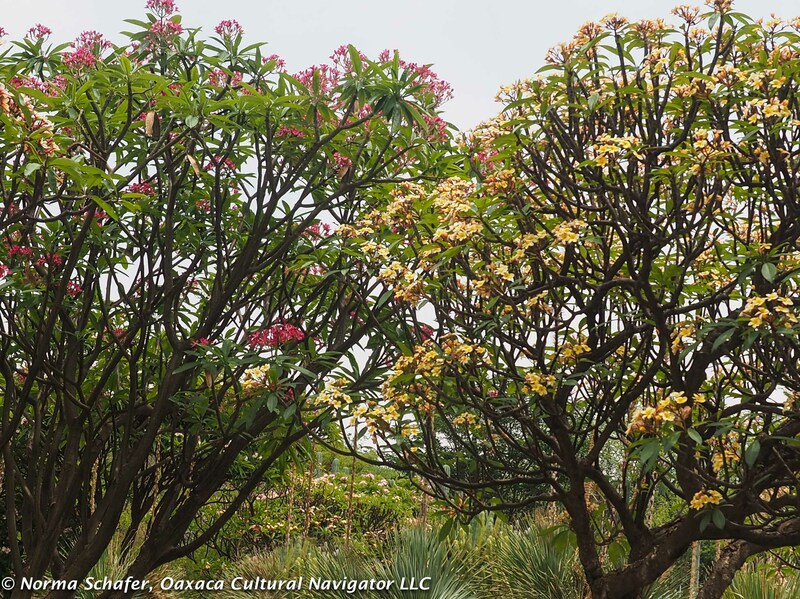 The Flor de Mayo, as it is known here in Oaxaca, was resplendent in color. We know it as plumeria rubia or frangipani. Of course, the landscape design students loved seeing it, picked up the dropped petals, and the young women attached them to their hair behind their ears. 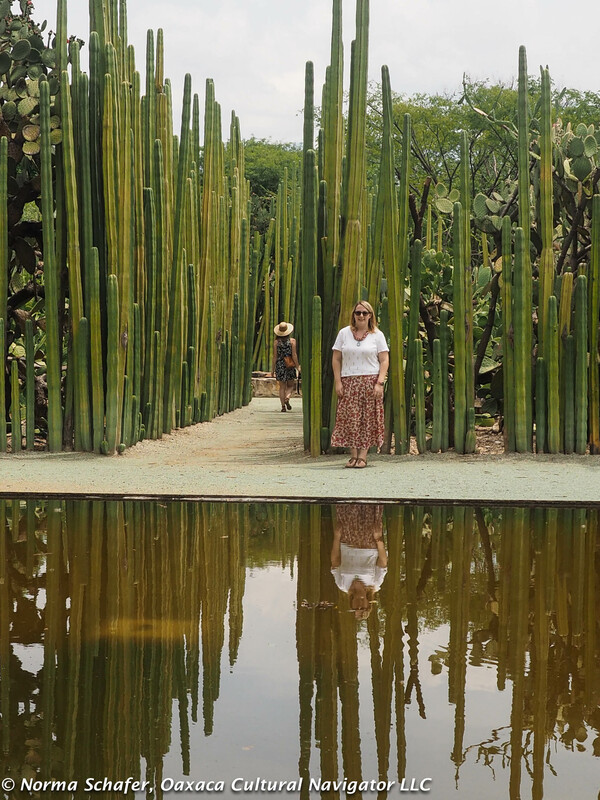 The tropical section of the Jardin Etnobotanico is a lush oasis filled with palms, fruit trees and a dampness that mimics the climate of Oaxaca’s Pacific coast. Tucked into the far corner of the garden, beyond the plant propagation area, is a two-story glass greenhouse. 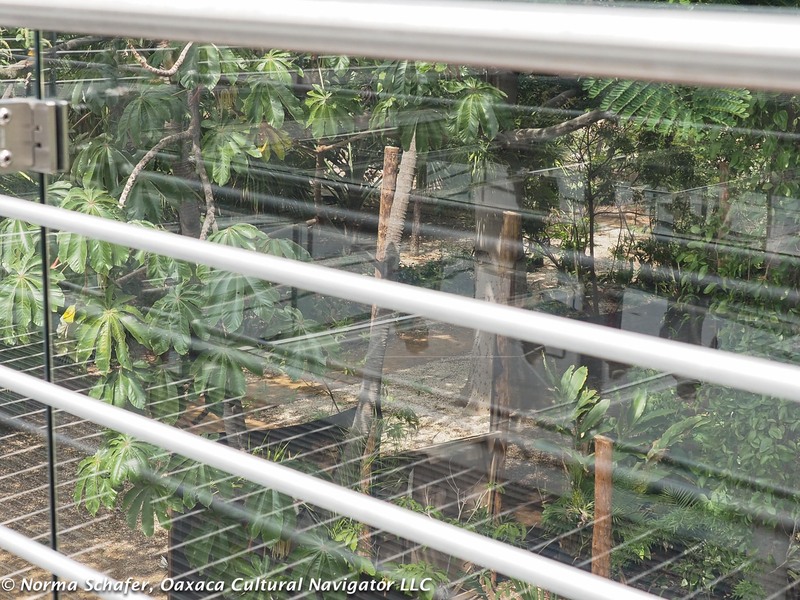 The greenhouse was designed by Mexican architect Francisco Gonzalez-Pulido. It is a transparent structure with a center staircase that we could climb for a second-story view of the city and adjoining countryside. Georgina says on a clear day you can see the distant village of San Pablo Villa de Mitla. We came to find out that Professor Ricardo Hernandez from NCSU is one of the world’s leading experts on greenhouse lighting. He took a special interest in this structure. I think what the garden does best is connect the dots between past and present, and gives us an outlook to conserve the future of our planet. 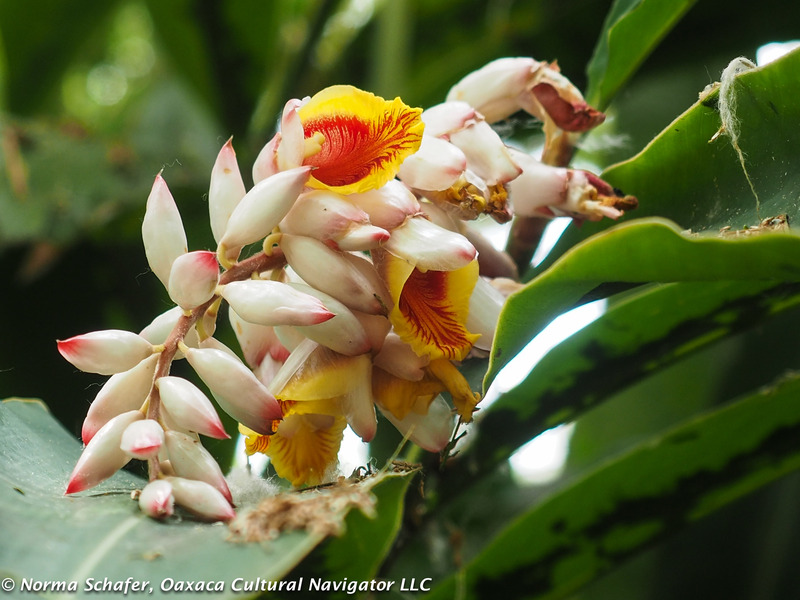 The plants are intimately connected with the indigenous people of this region. We get a perspective for this listening to Georgina. 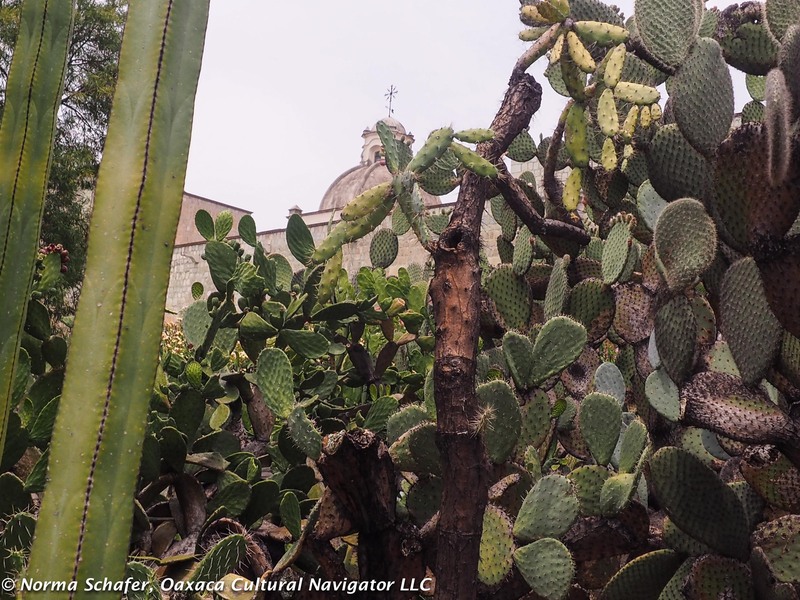 The Garden is a teaching laboratory for Mexicans and visitors alike. 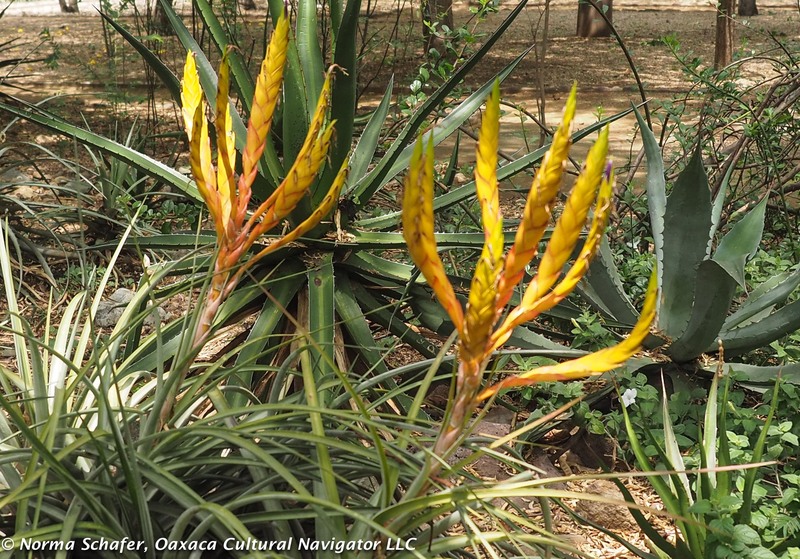 We hear about agave as a beverage and fiber source. How the leaves are pounded, washed and then the fibers woven into clothing and field bags. 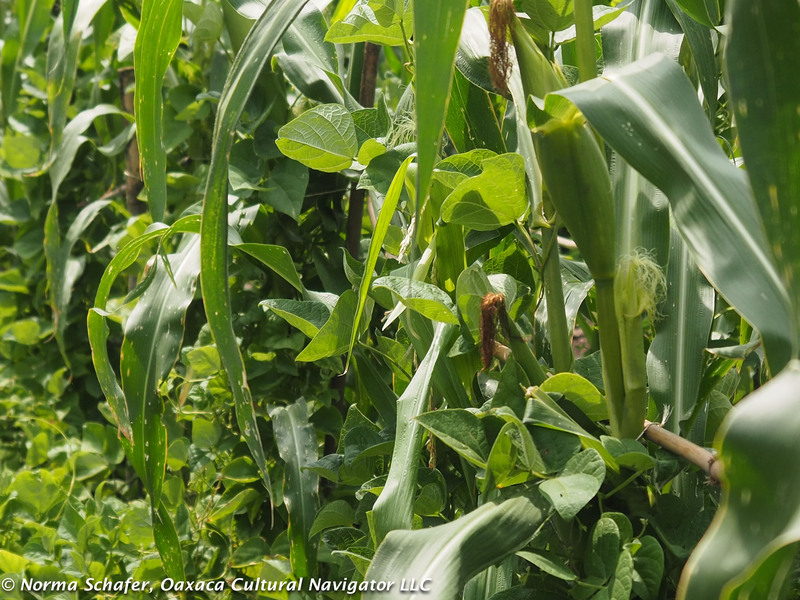 We see the stand of corn, growing with squash and beans — all native to Mexico, her gift to the world — and the agricultural system of milpas. This is the interdependent chemistry exchange between these three plants that give sustenance for the people, and when grown together, nutrients for the soil. 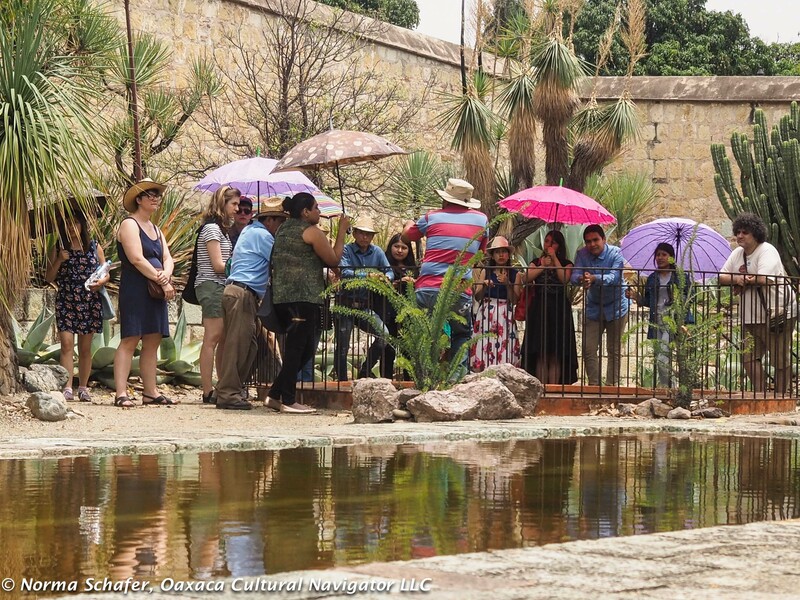 Sourcing and conserving water has always been a key part of living in Oaxaca. Georgina explains that there was a water capture system and that water came to the city center from San Felipe del Agua in the foothills above the town. 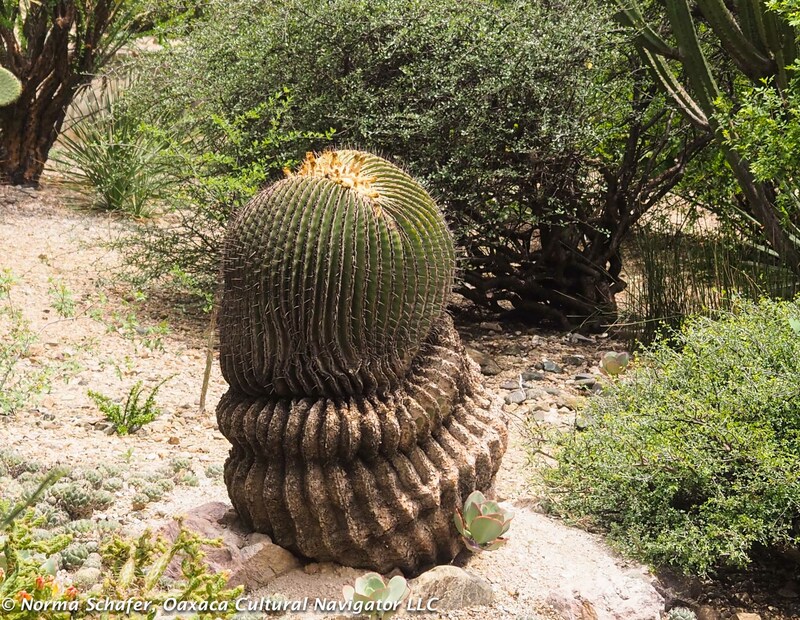 When the Jardin Etnobotanico was first conceived of, the space was barren, bare. It needed to be excavated and prepared with raised beds. In the process, they discovered an ancient water system and well here, as well as a path that led to what we now know as the Pan-American Highway MEX 190. Today, rainwater is collected in cisterns beneath the patio of the garden as one of the many conservation measures. I’d like to personally thank Jardin Etnobotanico founder and curator Alejandro de Avila B. for permission to publish the photos I took in the garden. The space is unique, featuring only Oaxaca plants. 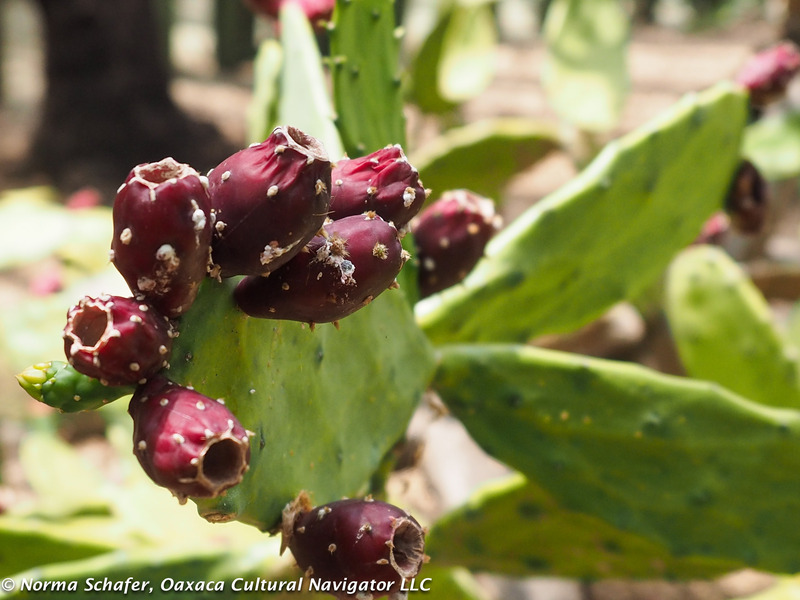 It gives us remarkable perspective into the diversity of people and regions in this magnificent Mexican state, and the interdependence of plants to people as source of food and shelter. I also want to thank Professors Ricardo Hernandez and Juliet Sherk for putting their trust in me to organize this study abroad program for North Carolina State University. It was a pleasure to work with them and to know their very talented students. 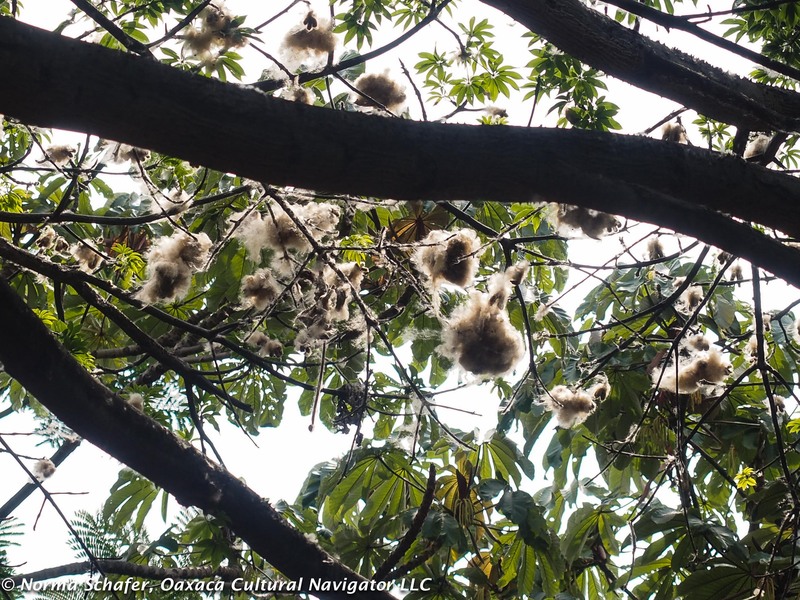 This tropical tree produces fluffy seed pods that indigenous people harvested and spun for clothing fiber. 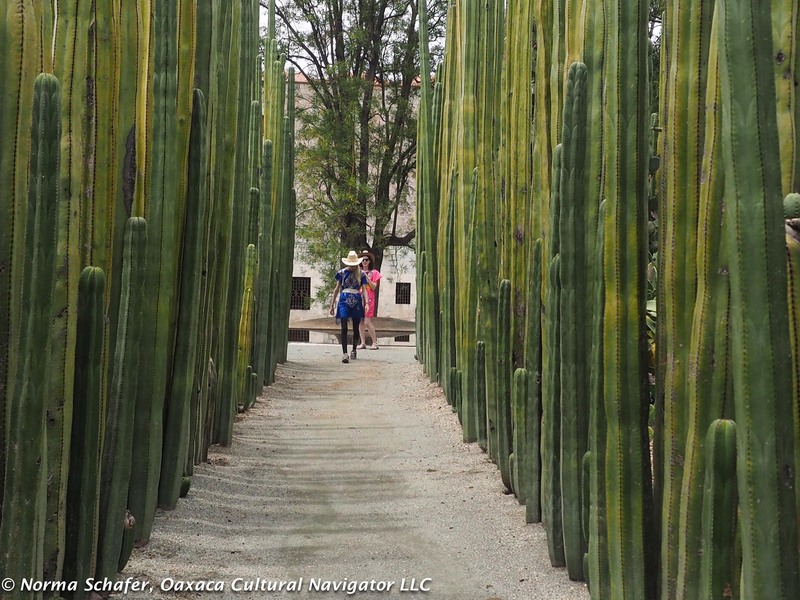 Oaxaca is textiles, culture, history, people and plants. 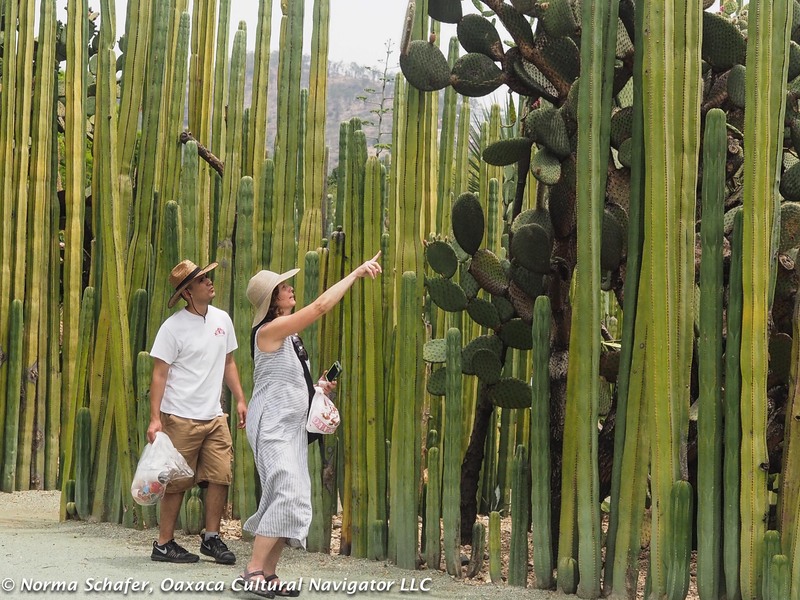 If you want to know all of Oaxaca, please take time out to visit the Jardin Etnobotanico, at the corner of Reforma and Constitucion. This entry was posted in Cultural Commentary, Oaxaca Mexico art and culture, Photography, Travel & Tourism and tagged ethnobotanical garden, jardin etnobotanico, Mexico, North Carolina State University, Oaxaca, study abroad. Bookmark the permalink. 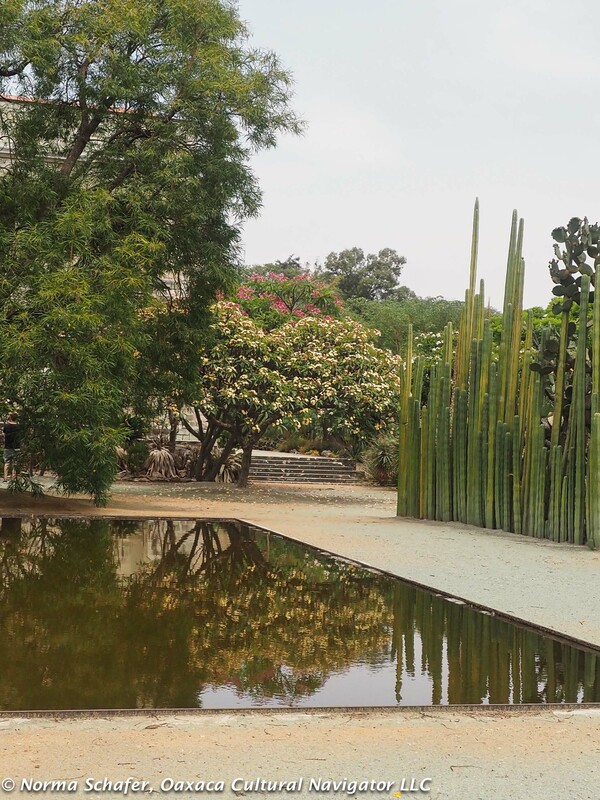 Beautiful article and photos about one of my favourite places in Oaxaca. I was there during the period of clean-up, restoring the surrounding buildings. On Sundays you could wander at will through the construction: very unsafe of course, but fascinating. I photographed crocks from the old convent still in situ. 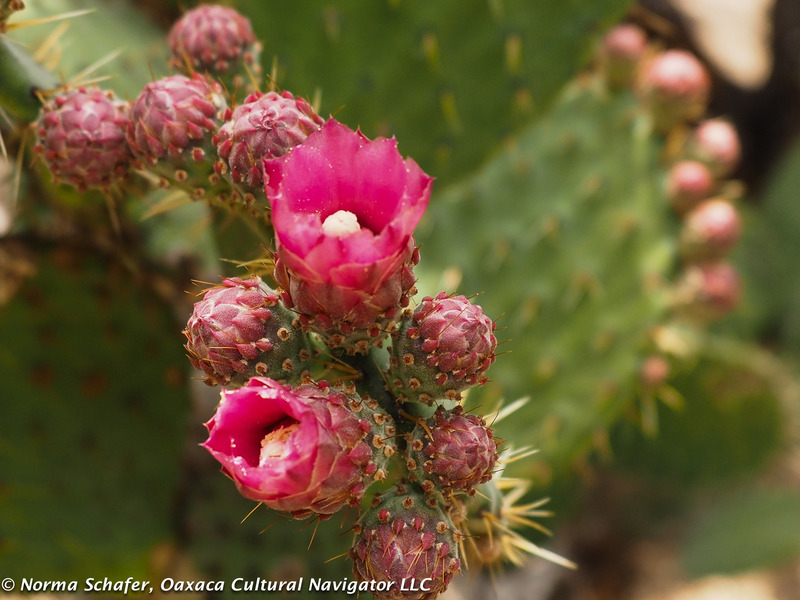 How they managed to bring in so many older specimens, and help them remain strong and healthy — like the biznaga cactus — is amazing. 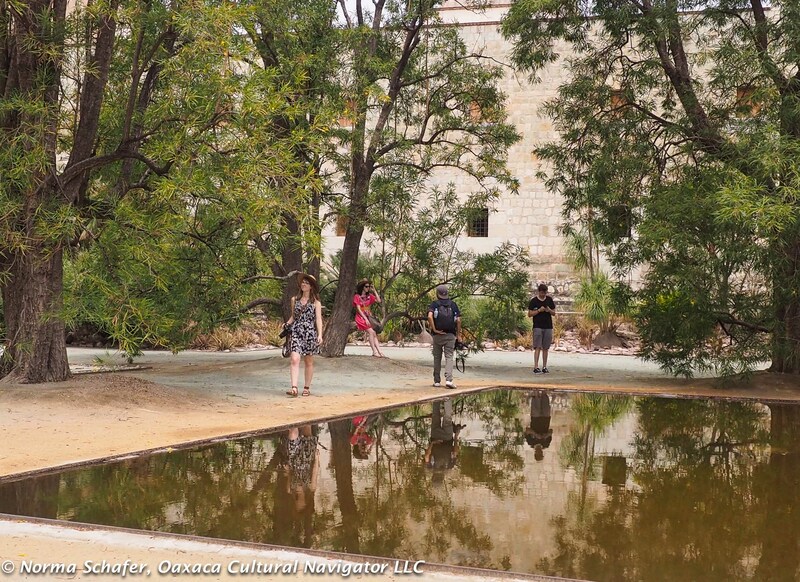 When I first visited Oaxaca in 1991, the army was still using the site where the garden is now. What is the now elegantly restored entrance, was heavily guarded by soldiers with machine guns.